The Bills have agreed to a one-year deal with free agent defensive end Ryan Russell, reports Mike Florio of Pro Football Talk (Twitter link). Buffalo has been interested in Russell for some time, as the club visited with the veteran lineman in May before bringing him in for another visit on Saturday. That’s been the only known league-wide interest in Russell, whom the Buccaneers allowed to hit the open market in the spring after opting not to tender him as a restricted free agent. 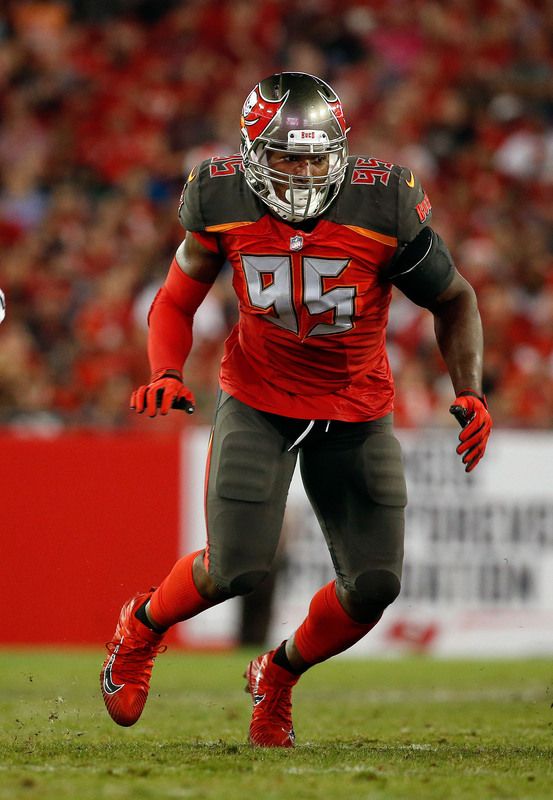 Russell, a fifth-round pick in the 2015, draft, appeared in 14 games and made six starts for the Buccaneers a season ago in a campaign that was his most active to date. The 26-year-old played on 456 defensive snaps for Tampa Bay (nearly triple his career snap count to that point), managing two sacks and 12 tackles in that time. Russell also chipped on special teams, seeing action on roughly 20% of the Bucs’ ST snaps. The Bills had been on the lookout for defensive line help, as they worked out former Bronco Jared Crick before inking Russell while also signing interior defender John Hughes. Russell, for his part, will compete for reserve snaps behind Jerry Hughes, Trent Murphy, and Shaq Lawson. In order to create a roster spot for Russell, Buffalo has waived defensive end Owa Odighizuwa, the club announced. The Bills continue to examine options for their defensive line. This means a second offseason trip to Buffalo for UFA defensive end Ryan Russell. A former Buccaneers contributor who started six games last season, Russell is visiting the Bills on Saturday, Ian Rapoport of NFL.com tweets. Russell made the trip to western New York in March as well, but the parties moved on without a contract in place. Buffalo brought in Jared Crick for a workout this week as well and signed defensive tackle John Hughes, with Rapoport noting the Bills are on the lookout for D-line aid. A former Cowboys fifth-round pick in 2015, Russell played in one game with Dallas but suited up for 14 with Tampa Bay the past two seasons. Buccaneers free agent defensive end Ryan Russell will visit the Bills on Wednesday, Ian Rapoport of NFL.com tweets. The Bills are scoping out the remaining available pass rushers and Russell could be a fit. The Bucs non-tendered Russell earlier this year, allowing him to go from a restricted free agent to an unrestricted free agent. Despite starting in seven games for Tampa Bay last year, he has not garnered a ton of interest over the last two months. In 2017, the former fifth-round pick had two sacks – the most of his career – and 16 total tackles. The advanced metrics were not crazy about his work, however, as he graded out as one of the four worst qualified edge rushers in the league, per Pro Football Focus. The Bills have revamped their defensive line this year by adding defensive ends Trent Murphy, Owa Odighizuwa, and Terrence Fede as well as defensive tackles Star Lotulelei, Tenny Palepoi, and third-round pick Harrison Phillips. Given the strange nature of Odighizuwa’s previous tenure with the Giants, it only makes sense for the Bills to explore other reserve options at DE. The Bears promoted fullback Paul Lasike to their active roster, Brad Biggs of the Chicago Tribune tweets. Lasike’s been active in four of Chicago’s eight games this season and has taken two handoffs, gaining three yards. The 26-year-old blocking back’s previous stay on the 53-man roster concluded when the Bears waived him to promote Pernell McPhee last month. 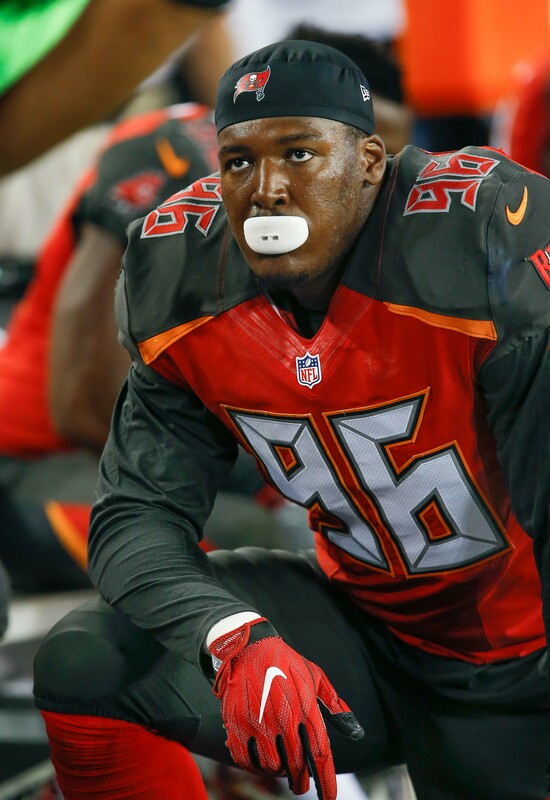 The Buccaneers promoted defensive end Ryan Russell to their active roster, where he’ll take running back Russell Hansbrough‘s spot, Greg Auman of the Tampa Bay Times reports (on Twitter). Doug Martin being set to return to action made Hansbrough expendable, though with the team short on healthy backs he could return to the practice squad. A former fifth-round Cowboys pick, Russell played in one game for Dallas last season. He has yet to suit up in a game this year. To make room for the recently activated Derek Carrier on the 53-man, the Redskins waived cornerback Dashaun Phillips, the team announced. Phillips started two games for Washington this season and saw action in three.